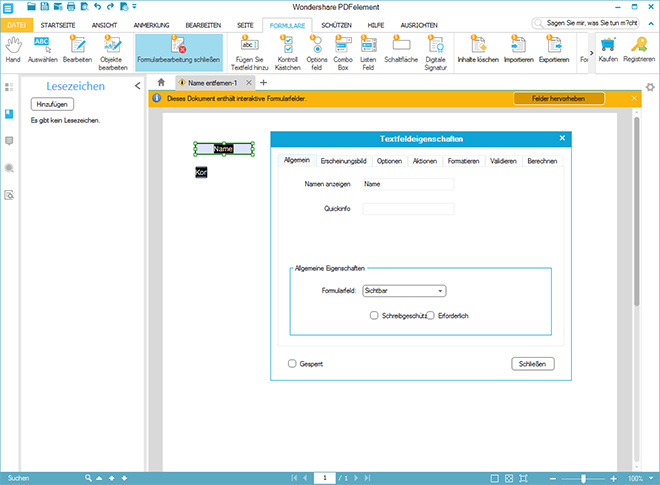 PDFelement is available as a classic desktop application for Windows and Mac. When starting the PDF editor, first choose one of the four basic functions that allow you to either create, combine, convert or edit a PDF file. Creating PDF files is as easy as it gets. Just open any file – no matter if it’s an image file or an Office document -, and it will be available as a PDF file in PDFelement. Afterwards, you are able to add bookmarks or notes to single pages. Alternatively, it’s also possible to create PDF files via a PDF printer. This way, you create a PDF file in any application and then edit it in PDFelement. The big advantage over simple PDF printers is the option to alter an existing PDF file. For instance, changing text is child’s play. Here, the formatting remains, as long as the used font is available on your system. While text editing, single paragraphs are displayed as a text field. You are able to change the text, as well as move the text field, or adjust the font, and its size. The same thing works with all other elements, like images, for example. While Adobe Acrobat usually compiles texts in one large block, you are a lot more flexible with PDFelement, because the paragraphs can be edited individually, making them relocatable. You also have the option to add new content to your PDF file. 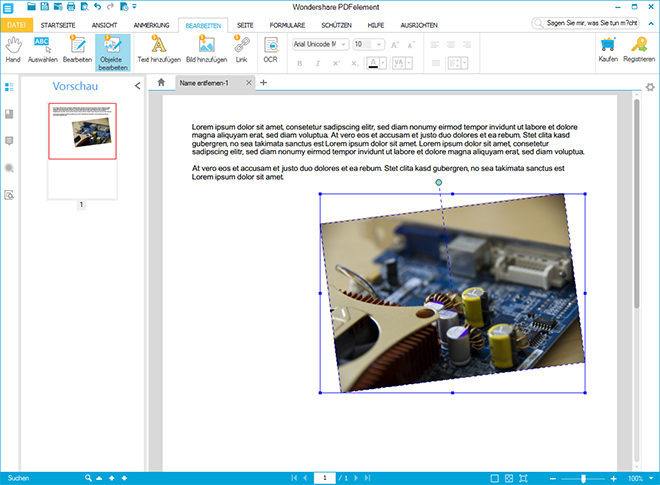 Place new text, and import images that you get to scale, rotate and move in the document. On top of that, add a link to a website or a page within the PDF file to your texts. Alternatively, you could also freely place links on a page by drawing an area that will be provided with a link. PDFelement is not only suitable for making small changes to a PDF document. You also get to add pages or from other PDF files, or even blank pages. 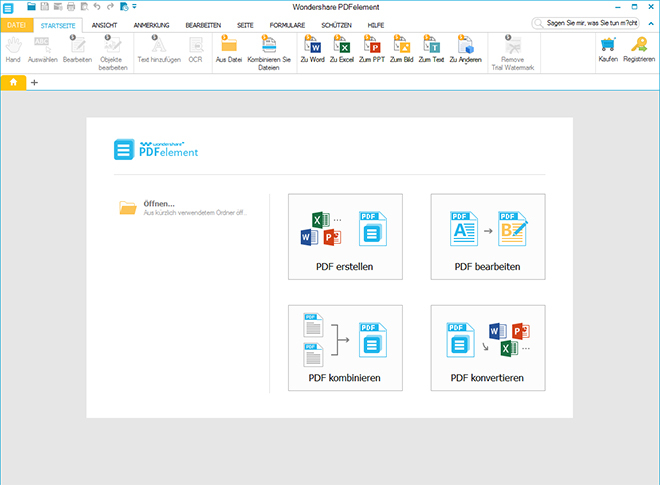 You can also set up an empty PDF document and create all the content directly within PDFelement. Place texts, images, links, and even create headers and footers that will automatically be integrated on each page of your document. Adding an automatic page numbering is not an issue either. There are further features that enable you to edit single, or all of a document’s pages. Thus, you can prune a page to a specific section. You rotate pages and have the option to replace single pages, or to turn them into independent PDF files. PDF files that contain sensitive information are not a rare thing. Oftentimes, bills, contracts, and other confidential documents are often saved in the PDF format. To assure that unauthorized people don’t have access to this kind of information, PDFelement lets you protect your confidential PDF files with a password, for example. There are different ways of protecting your document via password. You can make a password required to open the document. Alternatively, you could also only protect the document from printing and editing via password. 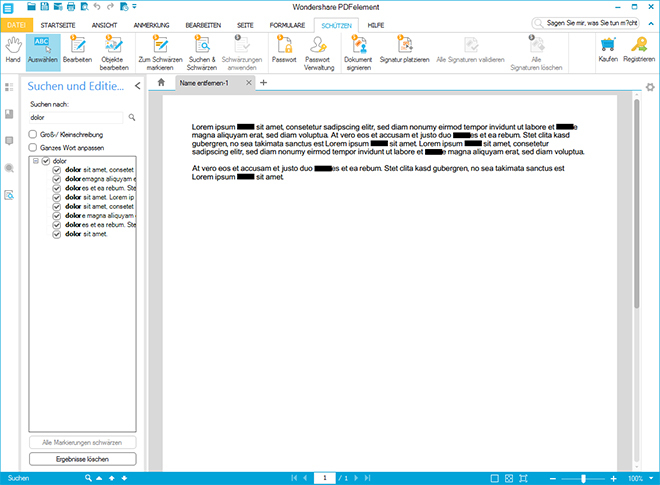 If you happen to want to send documents with private information to third parties, PDFelement also allows you to black certain contents of a document. For instance, you could look for names and contact information via search function, and then cover them with a black bar. Here, the original content is actually deleted from the document, assuring that it is not possible to recover this information. It is also possible to add a signature to a PDF document, in order to make it easy to trace back its origin. Either create signatures yourself, or just implement existing ones. Oftentimes, PDF files contain interactive forms that can be filled in directly within the PDF reader. Creating this type of PDF forms is also very simple when using PDFelement. For example, the special form mode lets you place input fields, check boxes, as well as pick lists. Each form element contains plenty of attributes that enable you to define appearance and functionality. Place mandatory fields and decide what should happen during picking or entering. For instance, you could call up a link or fade in or hide other form elements. It is possible to print finished forms, or send them to a certain address via email. An alternative option is sending the form information to a web address that processes the information server-sided. While turning an office document into a PDF file has never been a problem, this usually is not possible the other way around. However, PDFelement even allows you to do that. To do so, pick a desired target format. There are Microsoft Word, Excel, and PowerPoint in different version to choose from. An export into different image formats is also possible. 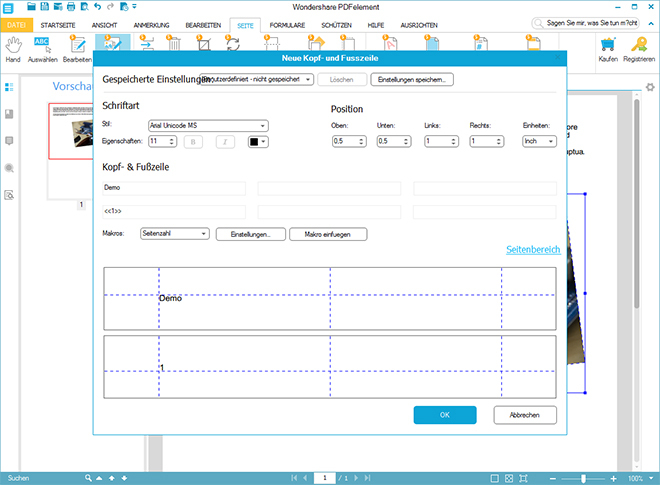 During the export into an Office format, the formattings remain, so that the PDF file’s layout is transferred into the export format. PDFelement by Wondershare can be tested in a free trial version. Here, all PDF files you create are labelled with a watermark. If you decide to license the application, removing the watermark from your documents is no problem at all. Thus, you won’t have to recreate them. PDF documents are not always created from existing Office files, but also from JPEGs and other image formats. PDFelement recognizes that and suggests using a text recognition. Especially with scanned documents, the OCR function makes sure that your texts are made copiable. However, the text recognition is not usable in the trial version. If you decide to license PDFelement, a license for private use will cost you $69,95 per Windows computer. The license for commercial use is $119,95. If you also want to use the OCR function, PDFelement will be $89,95 for private, and $149,95 for commercial purposes. The Mac versions are a little more expensive. 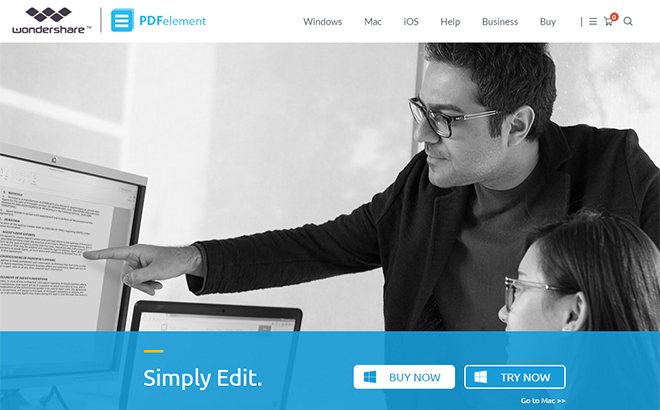 When compared to other PDF editors with a similar scope of features, PDFelement is a true bargain. On top of that, you’re guaranteed to receive free updates for a lifetime.